Hello and happy November! Where has this year gone? I'd be more bummed out that it's fall (I'm a summer kind of girl) but since I've moved to Los Angeles the seasons changing has become kind of moot! Regardless, one can still celebrate seasonal colors and this Bernie Dexter dress is the perfect outfit to do so in! Frankly, I think it's great for all seasons, but the reds and yellows make it impossible to ignore in autumn! 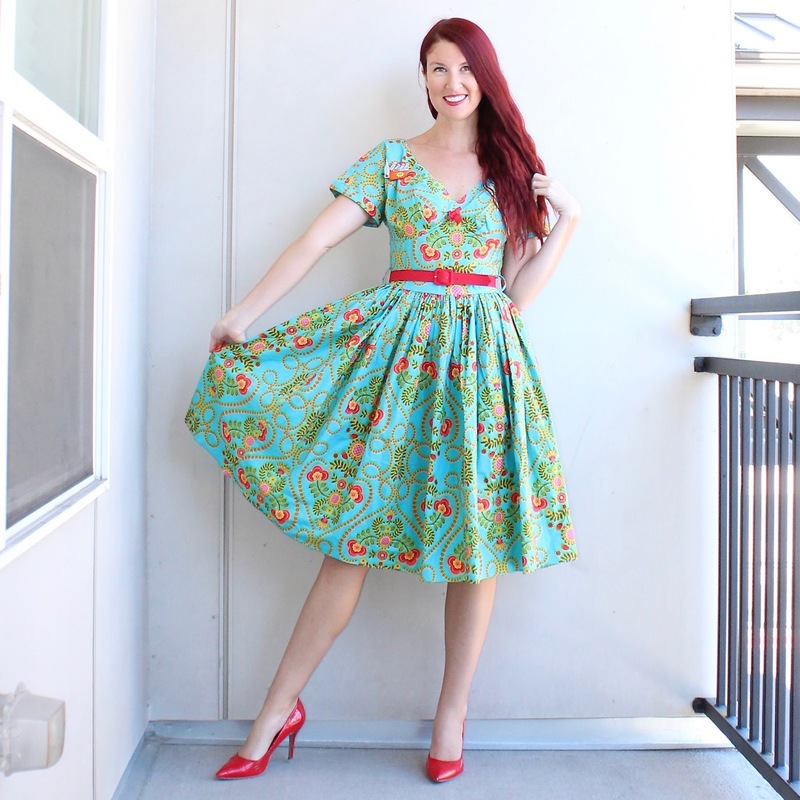 This dress style is a Victoria dress, and it is an oldie but goodie! I believe Bernie has long retired them!! If you're in love with this style you can search on eBay and Poshmark for them and will eventually get lucky. There's also a plethora of new Bernie dress with sleeves, (like the Kelly dress and Drive In dress), so fear not if you like short sleeved dresses! I find that all of the Bernie Dexter dresses with sleeves tend to be a more relaxed fit, for what it's worth. And for measure, I am in a size XS. I think the Victoria dresses run the largest out of all of the Bernie dresses (with the Chelseas being a solid second). This dress (and other Victoria dresses) were covered HERE in a Gaga for Bernie Dexter post (along with a few other styles) in case you want to read further on the fit of this dress! Styling wise I kept it really simple, as you can tell! Statement dresses like this don't need much. I'm wearing my red Nine West Flax Pumps and my Erstwilder soda brooch (which I neglected to get a close-up in because believe it or not, I had a fever when I took these and was spaced out!). I hope everyone had a great weekend! Though I've been a student at the Upright Citizen's Brigade for two weeks now I finally got to see my first UCB show on Friday night with some of my fellow students! It was a lot of fun and afterwards I got to get to know some of my new classmates better, which was really lovely. It's crazy being in a new city, meeting a ton of people, but not being totally bonded to anyone quite yet! I'm happy to report that I'm liking everyone I've been meeting so far! The rest of the weekend I had class and then got to run a million errands--hooray! Ha. Hope everyone has had a great couple of days!